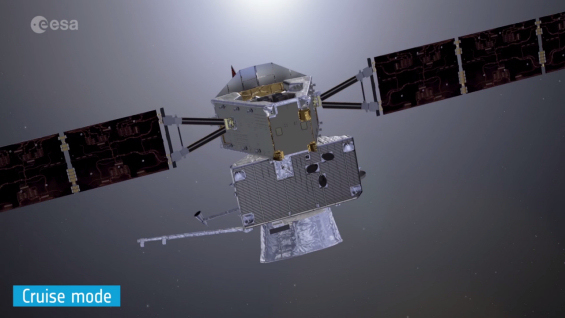 BepiColombo, an ESA mission being conducted in cooperation with Japan, will explore Mercury, the planet closest to the Sun. The Mercury Planetary Orbiter (MPO) is ESA's scientific contribution to the mission. The Institute of Space and Astronautical Science (ISAS) at the Japan Aerospace Exploration Agency (JAXA), is providing the other science spacecraft, the Mercury Magnetospheric Orbiter (MMO). ESA is also building the Mercury Transfer Module (MTM), which will carry the two orbiters to their destination, and the MMO Sunshield and Interface Structure (MOSIF), which provides thermal protection and the mechanical and electrical interfaces for the MMO. The Mercury Composite Spacecraft (MCS) consists of the MPO, MMO, MTM and MOSIF. ESA is responsible for the overall mission design, the design, development and test of the MPO, MTM and MOSIF, the integration and test of the MCS and the launch. BepiColombo is scheduled to fly in 2018, on board an Ariane 5 launch vehicle from Europe's Spaceport in French Guiana. The Launch and Early Orbit Phase (LEOP) will start around six hours before launch, with pre-launch operations comprising spacecraft activation, pre-launch checkout and preparation activities for the launch. About 15 minutes before liftoff, the umbilical connector to the external power supply will be removed and the spacecraft will run on internal battery power. The ascent and injection phase will last 28 minutes and will end with the separation of the MCS from the launcher. Upon on-board detection of separation, an automatic sequence will perform priming of the MTM reaction control system and initiate Sun acquisition together with deployment of the MPO and MTM solar arrays while the Attitude and Orbit Control System (AOCS) is temporarily disabled. Finally, Sun re-acquisition with stabilisation in a slow spin around the Sun vector will be performed. Telemetry downlinking via one of the low-gain antennas will be initiated during this sequence, as soon as a ground station is visible. The antenna with the best view of the ground station will be automatically selected when an uplink carrier signal is detected. After spacecraft stabilisation, the ground operations centre will take control and command the spacecraft into normal operational mode. This phase ends on the fourth day after launch, with the execution of an injection error correction manoeuvre, if required. solar-electric propulsion functional checkout and in-flight validation. Final commissioning of the MPO payloads and the MMO will take place in Mercury orbit. The interplanetary cruise phase includes the commissioning of the MTM solar-electric propulsion system, the electric thrust phases, coast arcs and the planetary fly-bys. Periodic MPO payload and MMO health checks will be performed, typically every six months. Several solar conjunctions with degraded communications link performance will occur. The Earth distance will reach a maximum of 1.6 AU and the Sun distance a maximum of 1.2 AU and a minimum of 0.298 AU during this phase. The duration of the cruise phase will be 7.2 years for a launch in 2018. The spacecraft will leave the Earth with an hyperbolic excess velocity of 3.475 km/s. 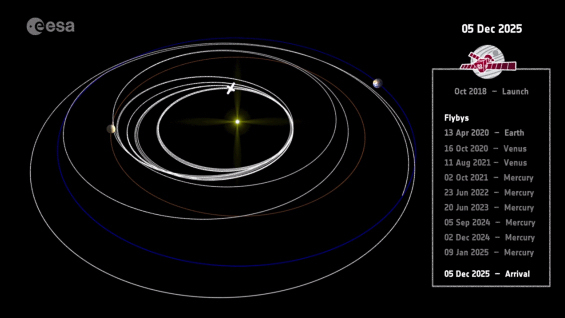 After one year and a half, it returns to Earth to perform a gravity-assist manoeuvre and is deflected towards Venus. Two consecutive Venus flybys reduce the perihelion to nearly Mercury distance. A sequence of six Mercury flybys will lower the relative velocity to 1.84 km/s. Four final thrust arcs further reduce the relative velocity to the point where Mercury will weakly capture the spacecraft on 5 December 2025, without an orbit insertion manoeuvre being required. The Mercury approach phase starts after the last electric propulsion manoeuvre has been completed, approximately two months before the first Mercury orbit insertion manoeuvre. During this phase, the MTM will separate from the spacecraft stack. The remaining composite of MPO/MMO/MOSIF, the MCS Approach configuration (MCSA), will drift into Mercury's sphere of influence, and will need only a small manoeuvre to get captured in an initial orbit of approximately 674 × 178 000 km. This process is known as a 'weak stability boundary' capture. The MPO will perform the Mercury capture manoeuvre at pericentre and then the manoeuvres for orbit lowering to the MMO mission orbit. After final checkout and preparation, the MMO will be separated in the required attitude and simultaneously spun up by the separation mechanism. The MPO with the MOSIF still attached, the MCS Orbit configuration (MCSO), performs another two manoeuvres for pericentre raising and apocentre lowering, and then separates the MOSIF in a safe direction. The MPO then descends further to its own mission orbit. Once the MPO mission orbit is reached the final commissioning of the MPO and its payload is performed; this will last about one month. The MPO attitude follows a continuous nadir-pointing profile, providing optimum viewing conditions for the payload. All MPO science data will be stored in the spacecraft's solid-state mass memory and downlinked during daily station passes with ESA's Cebreros ground station. Every half Mercury orbit, about every 44 Earth days, the attitude of the spacecraft will have to be reversed around the nadir direction to keep the radiator pointing away from the Sun. The MMO will communicate with the JAXA/ISAS Sagamihara Space Operations Center via the Usuda Deep Space Center (UDSC) 64-metre antenna in Nagano, Japan.